Are you an adult that requires adult supervision while using the stove? No worries! We’re here to give you the basic skills you need to be comfortable and confident in the kitchen. Becoming a competent cook is easier than it seems. All it takes is some patience, practice and a few ideas to build your confidence. 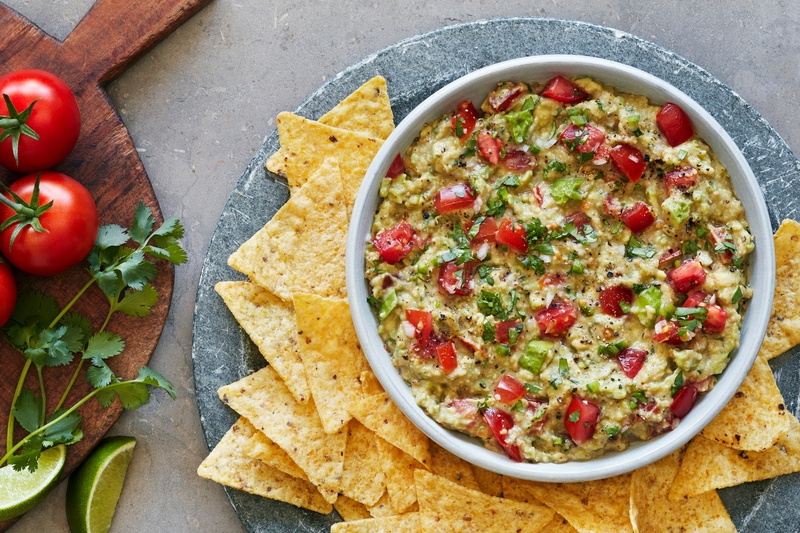 We’ve compiled 4 easy to prepare, delicious to eat recipes that will help you turn your beginner skills into expert results in the kitchen. Try them out one at a time. Each recipe builds upon the skills of the last and takes less than an hour to prepare from start to finish. Skills obtained: Presentation and aesthetics… And a thin veil of fanciness. Just saying the phrase “balsamic glaze” to your guests will make them believe you are a fancy person. This recipe is a great place to start because it’s just a matter of assembling your ingredients. 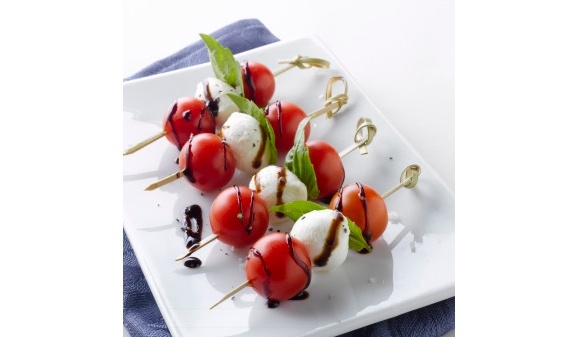 Once the basil leaf, tomatoes, and mozzarella ball are on the bamboo stick, lay them on a plate, sprinkle with salt and pepper, and drizzle with a balsamic glaze before serving. Voila! These small but mighty appetizers are versatile and very delicious. Skills obtained: Presentation, knife skills, ratios of ingredients, and texture. Salads are like cats – many people say they don’t like them, but that’s because they haven’t met one they like yet. 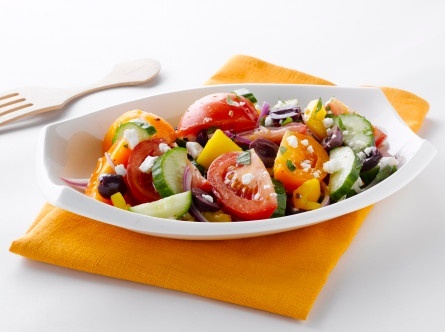 Creating a salad that is interesting is a simple task with this Glorious Greek Salad. The different sizes and textures of all the vegetables, combined with the saltiness of the feta and dressing will make your guests’ mouths water! The best part about this salad is how much chopping there is. Lots of practice for you! But you don’t need to be precise or try to get every cut to look like the last one. Always wash your vegetables and give them time to dry. If the vegetables are still wet, the dressing won’t stick to your ingredients as well, and your salad can become soggy. For most vegetables in this recipe – like peppers, onions, and cucumber – a chef’s knife (the large knife in your knife set) is the proper knife to use because you use a rocking back-and-forth motion to chop. Don’t be afraid of the big knife … Go big or go home! Tomatoes on the other hand, require a serrated blade (a bread knife). The reason for this is the tomato’s thin, yet surprisingly strong outer surface (skin). That chef’s knife that slices through peppers and cucumbers will struggle against this skin but the teeth of a serrated knife will cut through it with ease. To keep things interesting, play with the sizing of your vegetables in the salad. The different sizes create texture and make eating it a more enjoyable experience. HERB HACK! When chopping herbs, roll them tightly, then roll a pizza cutter back and forth over them so they will be nicely chopped. It’s easier, and more fun! Skills obtained: Knife skills and ratios. Nervous about handling an avocado? Worry not. They are easy to work with once the seed is out. 1. Using a sharp chef's knife, slice through the avocado lengthwise until you feel the knife hit the pit. Then rotate the avocado, keeping the knife steady, to make a cut all around the pit. Twist the two halves apart. 2. Carefully, make a cut into the seed, then move your knife back and forth until the seed comes out. Toss the seed. 3. Take a spoon and scoop all the green fruit out of the shell into the bowl. Don’t be afraid to scrape the sides of the shell. Toss the shell when you’re done. Skills obtained: Using the oven, presentation, making a sauce. OK, you’ve had practice arranging ingredients and you’re more comfortable with a knife. It’s now time to dazzle your significant other with a creative dish that looks complicated but is easy to prepare. Down to business… let’s start utilizing two kitchen appliances: the blender and the oven. Using the blender is an easy task. Just dump in the two ingredients and blend for 30 seconds and you’re done. Easy! 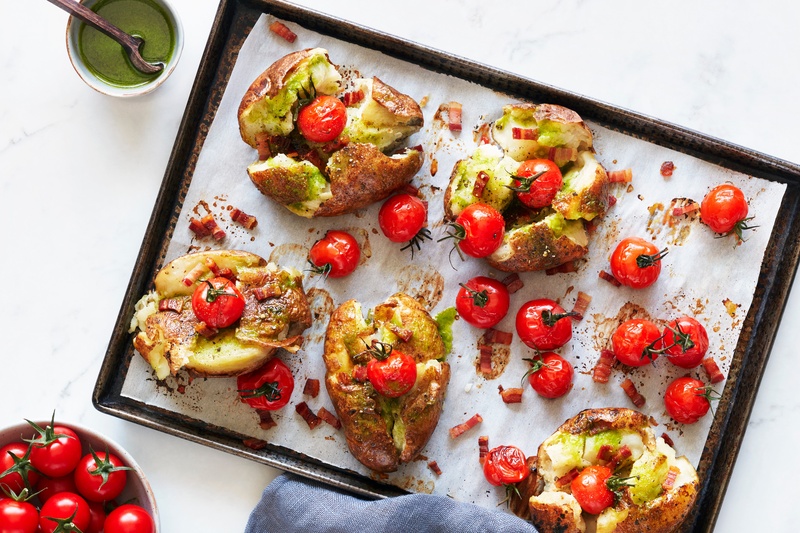 The best part about this recipe is the oven does most of the work for you; just pop the potatoes on a parchment paper lined baking sheet, drizzle with oil and rub with salt and pepper. Then they go into the oven. After 45 minutes, take a big spoon and smash the potatoes down. Then sprinkle with the remaining ingredients and put back in the oven for 25 minutes. This is where to pay attention: the potatoes are done when the edges of the potatoes are crunchy, so make sure to take them out of the oven before they burn. You don’t need special training or the latest gadgets to become a competent cook. All it takes is a little time, some patience, and a few well-chosen recipes that are fun to prepare and enjoyable to eat. 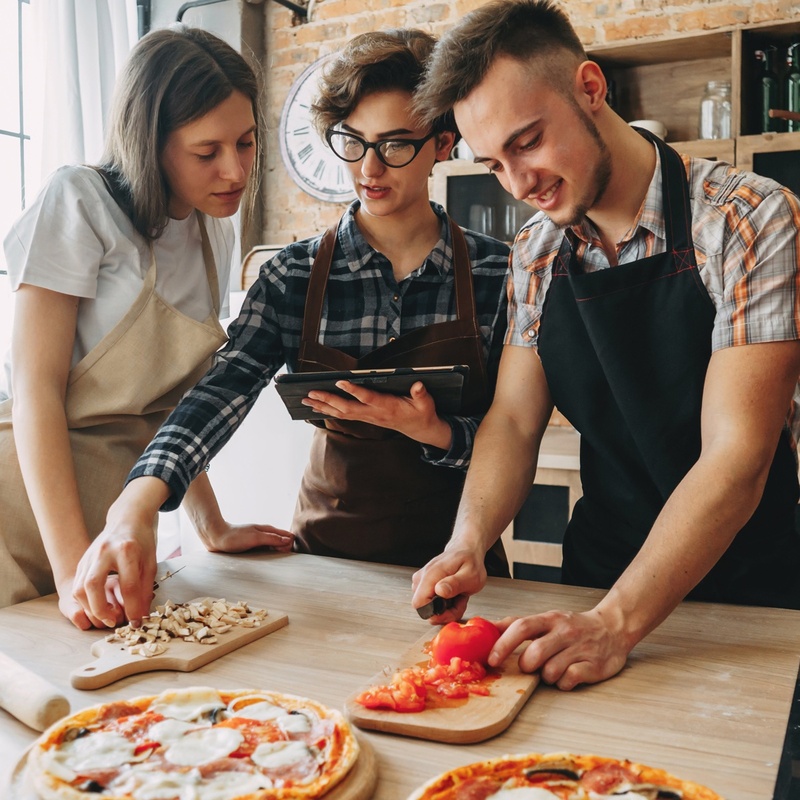 These 4 recipes are the perfect way to improve your presentation skills, become more comfortable with a knife, help you understand ingredient ratios, and give you confidence to turn on those big kitchen appliances. Try these beginner dishes and then graduate onto more complicated recipes, like this one and you’ll be on your way to becoming the home chef you’ve always wanted to be! We want to know, what was the first recipe you mastered?